You will be guided through moves emphasizing Vinyasa style breathing techniques and flow of postures. This mind/body adventure can be tailored to be gentle enough for beginners or more challenging for athletes. Sculpt a leaner, stronger body while releasing stress and fatigue. Music is carefully chosen to make your experience both fun and relaxing! 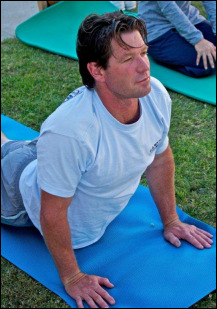 Yoga Classes are held at 2 convenient locations! Being outside in nature can heighten awareness, enhance your practice, deepen relaxation, and leave you feeling refreshed! Partners or family members attending together; 2nd person FREE! Here's what people are saying about Lawn Yoga For Everybody! "As a Fire Captain it is my responsibility to ensure that my crew and I are in the best physical condition possible to perform all aspects of the job. By taking Brenda's Sunday yoga class it not only keeps us flexible, but helps to prevent injuries as well!" for helping me to better my fitness and health." "As usual, it was a challenging mix of the familiar and unfamiliar asanas, carefully presented by a caring and aware teacher." "Awesome way to start your day! Great atmosphere, friendly people- no yoga snobs. Brenda gives you a great workout that is always a little different so you don't get bored." Whatever event you are celebrating, IFN will create a one-of-a-kind yoga experience to honor you and your guests and to fit any size budget. Common themes: Bridal, Employee Wellness, Birthdays and Anniversaries. 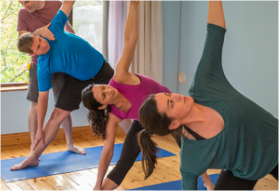 Yoga parties can be arranged at your home, workplace, or community.